A mounted rifleman was essentially an infantryman on horseback who fought most efficiently in open countryside. Mounted riflemen were expected to ride to the scene of a battle but – unlike traditional cavalry – dismount and go into action as normal infantrymen. The New Zealand Mounted Rifles Brigade comprised around 22% of the New Zealand Expeditionary Force which left New Zealand in 1914. It numbered 1680 men, divided between the Auckland, Canterbury, and Wellington regiments of around 550 men each. An Otago Mounted Rifles Regiment was also sent as a separate stand-alone unit. 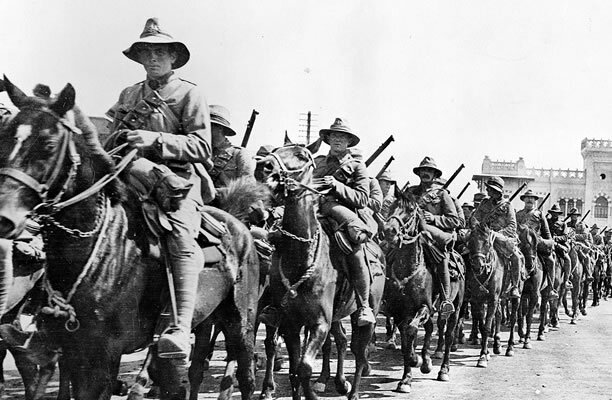 The Mounted Rifles fought on Gallipoli in 1915 without their horses. The NZEF was reorganised in early 1916 in preparation for the despatch of the bulk of the force to the Western Front as the New Zealand Division. It was clear by this time that mounted riflemen had little value in stationary trench warfare, so the New Zealand Mounted Brigade – with its Auckland, Canterbury, and Wellington regiments – was retained in the Middle East. It joined with several Australian and British units to form an Australian and New Zealand Mounted Division which served in Sinai and Palestine for the rest of the war. In Sinai and Palestine the mounted rifles were valued for their ability to patrol and reconnoitre over a much larger area than could be covered on foot. The key battlefield advantage of a mounted rifles regiment over a standard infantry battalion was superior mobility. Key disadvantages were that it had fewer men and fewer support weapons. The Otago Mounted Rifles Regiment, reduced to a single squadron, moved to the Western Front with the New Zealand Division in April 1916. Renamed the 1st OMR Squadron, it was part of I Anzac Corps before joining II Anzac Corps in July 1916 as part of a 2nd Anzac Mounted Regiment with Australian troops. It fought at Messines (June 1917), Passchendaele (October 1917), against the German Spring Offensive (March–July 1917), and in the Advance to Victory (July–November 1918).